(NewsUSA) - Look skyward at the 2010 Winter Olympics in Vancouver this winter and you'll find some of the events' most daring -- and entertaining -- athletes. Aerial skiers blur the lines between athlete and stuntman, bringing acrobatics and skiing together to create a breathtaking spectacle. These daredevils speed 40 mph down steep slopes and launch off towering jumps. After rocketing nearly six stories skyward, they complete a series of gymnastic maneuvers before touching down on a landing pad of chopped, soft snow. Think extreme airborne acrobatics in a sub-zero gymnasium -- without safety nets or spotters. So how, exactly, does one get started in this crazy sport? We checked in with the Canadian National Freestyle Ski Team. With over 100 World Cup medals over the past four years, the Canadians are poised to make a serious run at the podium. A gymnastics background isn't necessarily required, but a healthy dose of courage is -- and a little time on the slopes doesn't hurt either. Most important is access to a training facility (there are only a handful across the U.S. and Canada) where athletes train on trampolines and in the water to perfect skills in a lower-risk environment before moving to the snow. Proper gear is also critical to success. Specialized equipment like skis and poles that are shorter and lighter than the traditional alpine variety provide increased mid-air mobility. Teams like the Canadian National Freestyle Ski Team are also leading the way in championing more technical apparel. This winter the team will be sporting Columbia Sportswear's new warmth technology Omni-Heat (available to consumers in Fall 2010) at the 2010 Winter Olympics. The reflective lining adds 20 percent more heat retention than conventional outerwear without added bulk or weight, while still being highly breathable and moisture wicking. Bottom line -- the athletes can stay warm and limber while waiting in the cold winter air between jumps. Aerial skiers' captivating stunts are sure to stir up even greater interest in this relatively new Olympic sport. 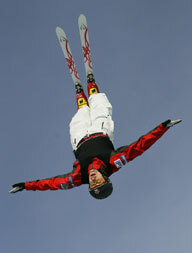 Twenty-six-year-old Canadian team member Warren Shouldice remembers the first time he saw aerial freestyle as a child. "I sat there and watched for hours . . . the things that they were doing just blew my mind. I had to try it. When I did, I was hooked -- the adrenaline is incredibly addictive." Aerial skiers defy the laws of gravity.